Patiala, 03 Sept- The Punjabi University Sri Guru Tegh Bahadur National Integration Chair in collaboration with Department of Linguistic and Lexicography and Panchnad Research Institute organised two days’ National Seminar on the theme of ‘Language as a tool to promote National Integration’ in the Senate Hall of the University, here today. Dr. Jaspal Singh, Vice-Chancellor Punjabi University presided and Dr. Kuldeep Agnihotri, Vice-Chancellor of Central University of Himachal Pradesh inaugurated the seminar. While delivering his presidential remarks Dr. Jaspal Singh said that diversity of languages is the key foundation of the Indian secularism. He further said that national integration and language play an important role in the making of strong and progressive country. If the nation is to progress it is very essential th਼ all the Indians must feel that they belong to one nation, irrespective of caste, creed, religion and language. National Integration alone can solve our social and economic problems, he added. On this occasion Dr. Jaspal Singh presented mementos to the visiting dignitaries. 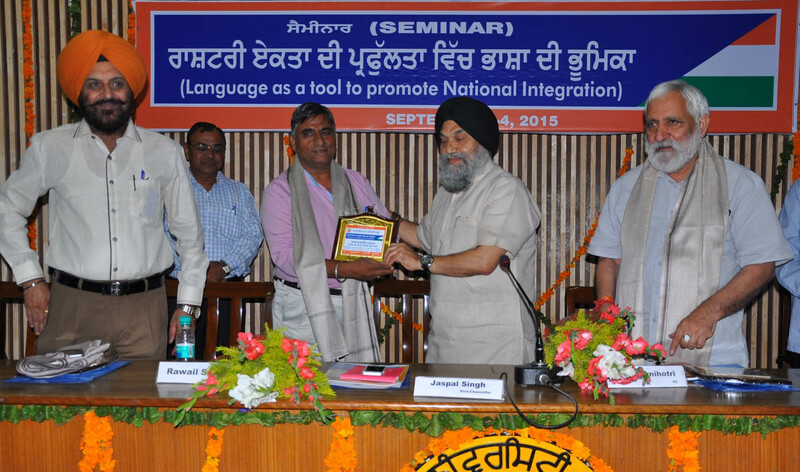 While presenting the Keynote Address of the Seminar Dr. Rawail Singh, Professor and Head, Punjabi Department, Delhi University said that Indian states were demarcated on the basis of languages but the burden of development of language was left with state governments. He, however, advised to solve language problems with the help of modern technology. Dr. Satish Verma, Dean, Faculty of languages also spoke on this occasion. Earlier while welcoming the guests Chair Professor Dr. Baltej Singh Mann gave a detailed report of the projects undertaken by the chair. Dr. Inderjit Singh Dean Faculty of Social Sciences presented a vote of thanks.